Gluten Free Baguette Recipe - you won't BELIEVE it's gluten free. One of the most popular recipes I’ve shared at gluten free food expos is my gluten free baguette. It draws a crowd every time. The smell of fresh-baked yeast bread, the gorgeous crust, the crunch on the outside with the pillowy soft centers … I haven’t met anyone yet (gluten free or not!) who didn’t think this gluten free baguette was incredible. There are a couple of secrets I’ll share with you about getting this gluten free French Bread just right. Another option is to use my gfJules Gluten Free Bread Mix. The mix makes it easy to make two large gluten free baguettes. These will be more like a whole grain version of the traditional white French bread, and they’re somewhat less crusty on the outside but no less delicious. You can see from the photo below that the texture is light, with nice air pockets throughout. It’s a great way to get homemade bread quick! Only 20 minutes to rise and 20-25 minutes to bake — how’s that for a win-win? Gluten Free Baguette made with gfJules Gluten Free Bread Mix. Wooden Gluten Free Board is from WordswithBoards.com. Unless you have an industrial spritzing oven for baguettes, another key is hand spritzing with water. You need a clean spray bottle and you need to spritz, spritz, spritz if you want your baguette to be crunchy. If you’d prefer to make a softer Italian Bread loaf, don’t spritz, and cover the bread during the second half of the bake time with foil to keep it soft all the way through. A third secret is the method. Take a moment to watch my quick video to see just how easy it is to make a beautiful baguette without even getting your hands dirty! Watch this quick video showing how to make gluten free baguettes! I suggest using a baguette pan for the best results, but you can use a cookie sheet lined with parchment in a pinch; the crust just won’t be as crunchy and it won’t be as nicely rounded, but it will still taste yummy! So go forth and bake baguettes like a pro! In France, it’s routine to buy a fresh baguette every day — now you can make a gluten free one, easily! And if anyone asks, I give you permission to share my secrets — no one should be denied the pleasures of delicious fresh-baked gluten-free bread! If mixing from scratch, whisk together dry ingredients except yeast; set aside. Using a stand mixer (preferably), slowly add in the dry ingredient mix. Gradually add remaining 1/4 cup of water to get a firm but very sticky dough. Pour in the yeast** and beat on high for an additional 2-3 minutes. (Note: this recipe may be mixed by hand in a large bowl, using a fork or wooden spoon and very strong muscles – stir as long as you can!). Prepare a baguette pan or cookie sheet by lining with parchment and lightly oiling. Pour one teaspoon of olive oil into a gallon sized zip-top bag and spread around so the inside is coated. Cut a one-inch corner out of the bag. Scoop the dough out into the bag squeeze toward the cut corner. Squeeze evenly so that the dough comes out of the corner of the bag and pipes down the length of the baguette pan or across the cookie sheet. If doubling the recipe, repeat the process until two baguettes are formed. Brush with egg wash or simply spritz with water. Use a sharp knife to cut across the tops diagonally about 3 times so that the dough will rise evenly and spread open at the cuts. Sprinkle any additional toppings at this point. Lightly oil a sheet of parchment and lay on top of the baguette. Place in a warm place like an oven preheated to 200° F then turned off. Allow the baguette to rise for 20-30 minutes, then preheat the oven to 375° F (static) or 350º F (convection). Remove parchment covering the baguette and spritz again with water. Bake for 20 minutes, spritzing again 1-2 more times during the bake for the crunchiest crust. You may also place a pan with water on the bottom of the oven to add additional moisture. Check after 20 minutes by sticking a toothpick into the center of the baguette. If it has wet dough stuck to the toothpick when removed, bake for another 3-5 minutes, then check again until the toothpick comes out nearly clean or with crumbs attached. The cooking time may vary depending on whether using a baguette pan, but when done, the baguette should be browning at least slightly (more, if using a whole egg to brush on top) and be crunchy when tapped. Remove to cool before slicing. ** Yeast-Free Directions: do not use yeast packet that comes with the mix; instead, add 2 tsp vinegar + 2 tsp baking soda + 2 tsp. baking powder. Chef Patrick Auger also recommends using club soda in place of the water in this recipe when baking yeast-free. I hope you love these baguettes as much as we do! Made these from the pizza crust mix. Family loved them. The celiac members of the family haven’t had bread in 3 months. “This is so good. Can I eat more? It’s just been so long without bread.” Thank you. I will be trying the plain ones next. It is wonderful how long it kept, especially considering it’s gf. That is wonderful to hear, Amy! I’m thrilled that you all have delicious bread back!!!! Yet another winner, Now that I feel more like a g-free baker, I try other flour blends and such and truthfully, I always come back to Jules. No funny taste, no slimy mouth feel like other blends give you, just that taste and texture you remember and miss so much. This is my daughter and I’s favorite French Onion soup topper. What would I do without your products? Oh Chari, that makes me so happy to hear! I’m just glad you know you can count on my products and bake your favorite recipes again, gluten free. Thanks so much for taking the time to let me know!!! I have made my share of bread. That said, it’s my first Gluten free bread. Followed the from scratch to the letter. Yeast was fresh. Bread did not rise at all. Any ideas? Hi Anna-Liisa, were you using my gfJules Flour? Any other subs for egg or milk powder or anything else? I made this last night and it was the best GF baguette I have ever had! That is why I gave it 5 stars. I was, however, disappointed that the pizza crust mix has carrageenan in it. I know this is a type of seaweed, but it can be very disruptive to the digestive tract. I will be making the baguette with the AP flour next time. I made the pull apart rolls last week and loved them! My husband is not GF and loved them too! I love your recipes and look forward to trying more. Thank you!! I made some gf French baguettes but the crust cracked while it was baking. Not sure what happened. Hi Anita, did you cut the tops of the baguettes before baking? That usually helps to guide where the cracks happen, but they will occur in a baguette because the outside is supposed to be crunchy, while the inside rises and expands during the bake. I hope that they still tasted yummy! Thank you for getting back to me. Yes I cut the tops of the baguettes. They tasted good however, the cracks were all over the baguettes . Hi Anita – that can happen. It’s all about how much the bread rises after the outside crust has formed. You could spritz with water again before putting in the oven, then cover with oiled foil for the first ten minutes, then remove it and spritz again to finish the rest of the bake. That might make it prettier for you! Do you have a weight measure for using your flour to make the baguettes? I have made them with the pizza mix; however, would like to make them with the flour mix as I’m more apt to have that on hand. I probably get too much flour by scooping and scraping off, or spooning and scraping off. Thanks for the great baguettes! Hi Nan, for reference, 1 cup of my gfJules Flour should weigh 135 grams. I don’t know why I didn’t have that measurement in this recipe, but I’ve added it – thanks for pointing that out! It’s 202 grams for this recipe. I’d love to know what you think of the from-scratch recipe in comparison to using my Pizza Mix! Happy baking! I am EXCITED. Ordering a baguette tray right away. Your pizza crust mix is awesome. My husband LOVES the pizza. So I KNOW the baguettes will also be great. And Jules, a while back, I asked if you would make a rice free flour….and from what I see, your pizza crust mix lists rice as a very end of the list ingredient – which would mean there is likely very little, right? This might work pretty well for my rice intolerant daughter AND my celiac husband! Hi Dawn, yes, rice is the smallest flour ingredient in my flour blend and my pizza mix – good eye! I don’t know how much rice bothers her, but there’s very little in the mixes (except graham cracker – lots of rice in there because it’s supposed to be gritty like a graham cracker! ), but they do contain some, so not suitable for anyone with an actual rice allergy. I can’t wait to hear how you all love the baguettes!!!! Can’t wàit to try these! I used to use these for stuffed French toast and we have really been missing it since going gluten free! OOOh that sounds really good! I can’t wait to hear what you think! He Jules. Can’t wait to try to make your Baguettes for the first time. I don’t have the pan yet so will be using a cookie sheet. Can this be made with any flour since I am allergic to corn so can’t use yours. Also what can I do in place of the egg wash? I am also highly allergic to eggs. Would olive oil brushed on top work to get them brown. Hi Connie, I’m glad you’re eager to try this recipe – it’s a great one! Not sure what to tell you about using any flour. The short answer is no, definitely not just “any” gluten free flour will do. Have you looked at my article on making your own flour if you can’t have corn? I would start there to make a blend that way that suits your dietary needs. About the egg wash, yes, just use oil to brush on top and I would suggest a flaxseed meal and water substitute for the egg whites in the recipe. I hope that helps! Make sure to build up some “walls” around the bread since you’re not using a baguette pan. This will keep the bread from spreading too much. Also, without the baguette pan, it won’t get quite so crispy on the outside — just so you know what to expect. Let me know how it goes! can you add sourdough starter to the pizza mix?? Do you have a sourdough recipe for a loaf of bread with your 8+ lbs of your flour that just arrived..??? We love sourdough everything. I’m SO glad you’re loving my flour!!! You can absolutely add sourdough starter anytime you like. Funny story about my sourdough recipe … (not so funny, actually): we moved earlier this year and I had just devised a great sourdough recipe and baked what felt like a hundred loaves, and somehow lost my notes in the move. hahaha – not. Anyway, it’s on my list to do, and in the meantime, if you have a good sourdough starter recipe you love, just use my gfJules Flour instead. Also check my GF Cuban Bread Recipe for another starter. ENJOY!!! Have these baking now, I seem to always write while things are baking, I have no pan, no spray bottle and just use a baking sheet and sprinkle using my fingers, its alway perfect. Someday my family will not use my spray bottles for everything but what I purchased it for.! hahaha – I completely understand how those spray bottles mysteriously go missing! So glad you’re making the best of it on a regular pan with sprinkled water, and that you didn’t let a little thing like a missing spray bottle hold you back! Enjoy those baguettes!!! So I was so excited to make my first gf Babette today with your flour. I followed all of the instructions carefully but need your advice. I didn’t watch your video until after I made the baguette. I noticed that my mixture, which I did by hand, was no where as sticky looking as yours. I could not find almond meal so I used almond flour/meal. Not sure if that made the texture different? After making the bread dough, I didn’t find that it rose as much as I thought it should. I left it a bit longer, still didn’t rise that much. I cooked the baguette in the baguette pan and had to leave it in 10 extra minuetes. I used the water to spritz on it three times. Unfortunly the baguette was gummy inside. Loved making cc cookies and oatmeal/raisin cookies with your flour and recipe….they came out perfect and delicious! Hi Pat, I’m so glad you love making chocolate chip cookies and oatmeal/raisin cookies with my flour – those are some goodies! As for the baguette, the almond flour could have something to do with it. You say yours wasn’t as sticky as mine looked to be – do you mean that yours also wasn’t as wet? If not, I would suggest adding more liquid next time so that it is more pliable and not resistant. If it’s too tight and drier, it won’t be able to rise as easily and that could contribute to it being uncooked in the middle. Also, do you measure by volume or weight? Measuring by volume can throw off a recipe if it’s not exact, which could also be a problem. The absolute easiest way to make sure you get a great baguette is to use my Pizza Mix because the ingredients are all in and it’s pre-measured. If you try again from scratch and still have troubles, I’d suggest trying the pizza mix so you can feel what the dough should be like and know what the results can be. I hope these ideas help, Pat, and that you don’t give up because the baguettes can truly be amazing!!!! Let me know how your experimenting goes! I recently bought the 1.05 lbs 17 Oz. bag of the gluten free pizza crust mix. The bag says it makes two Pizza crusts so you have to double the recipe, but it says nothing about how many baguettes it makes. The box you hold up in the video seems much smaller than this bag. So now I am not sure if I should follow your baguettes recipe but only use half the bag, or double the recipe. Or should I just use the entire bag and follow the recipe exactly… a bit confusing. This bag definitely seems bigger than the 1.5 cups of flour that you offer as an alternative, making it from scratch. Please advise!! Hi Liza, we recently transitioned our packaging to the bag you received, but each back is the same as the one box in the video (although you’re right – the bag does look bigger!). To make the baguettes in this recipe, you follow the directions for half of the pizza mix you received — the same as you would do to only make one 12 inch pizza; that amount will make 2 medium baguettes. If you want to make 4 baguettes, use the entire bag of mix. I will go back into this recipe and add information about the new packaging because I bet you’re not the only one who is wondering. Thank you for bringing this to my attention! If you have any more questions, feel free to email me directly at [email protected]. Happy baking! I live at 6,300 FT and can not get the baguette bread to rise. I tried both the pizza crust and the individual ingredient recipe. both came out like baseball bats. I also had a hard time with the mixer. Can you over mix the dough? Do you have any tricks on the yeast, should I add more? I am new to baking and know very little. . I am dying for a baguette. I’ve had no problems with the regular bread mix in the machine. The flavor and texture on this recipe are spot on. I used an off the shelf GF Flour which I never tried before (common grocery or retail), subbed Almond Flour (I wasn’t sure what Almond Meal is/was) and added small variants (1/8 tsp lemon juice, grape seed oil, 1/2 Tbsp of sugar, whipped the egg whites)… and used a spray bottle. The recipie held and was great. Working on a sour dough version, now. 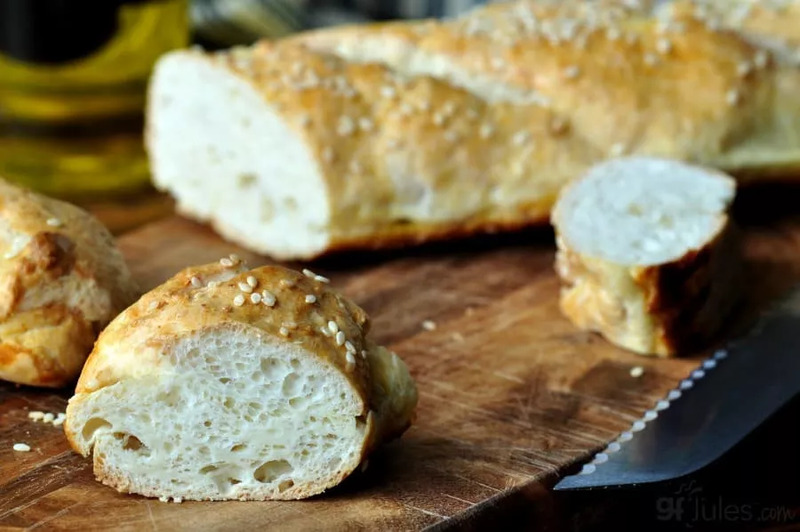 A solid GF baguette recipe that is a winner! Hi, just wondering why the yeast goes in last? Mine are in the oven rising as I write this. Glad to hear I’m not the only pulled-in-too-many-directions baker around, Allison! I don’t use a dough hook – I don’t find it mixes the GF doughs as well – try your paddle attachment. Does the baguette turn out right (cooked completely) even if the dough isn’t as thick? Your parm flavored oil sounds AH-mazing!!!! As for the yeast, it’s quick rise yeast, so it doesn’t need proofed, and I always add it in last after the dough is formed and the yeast just needs to integrate; you could add it with the dry mix if you wanted to. Shouldn’t make much of a difference. Glad you’re enjoying my pizza mix for baguettes, too! So, I tried a second time last night….without any interruptions! Only made one loaf instead of trying three smaller like the first time. Did the egg wash instead of the water too. It came out just like italian bread!! OMG! Love, Love. Love. Made a great pastrami sandwich!! Apparently the old adage, read the instructions multiple times before attempting the recipe, is true. After daughter and grandkids left I reread the instructions and found I hadn’t scored the first batch. They came out flat but very crispy. Loved the texture. Will definitely be doing this again with the paddle to see if it makes a difference. Wonderful, Allison!!! So happy you figured it out and were rewarded with delicious bread! Glad you didn’t give up – happy bread baking! Not matter what I have done to the muffin mix or the pizza mix it still tastes great. May not look fantastic but always tastes great. Thank you for a great way to satisfy a craving. That crispy baguette was Heaven! YAY! Third times a charm. I made it again and it came out PERFECT! I may be stocking up on the pizza mix very soon. My mother even tried it yesterday and loved it. FANTASTIC, Allison!!! So happy to hear it!!!! !